Collins Booksellers - Spectral Techniques In Proteomics by Sem, Daniel S., 9781420017090. Buy this book online. Facilitating the innovation, development, and application of new spectroscopic methods in proteomics, Spectral Techniques in Proteomics provides a broad overview of the spectroscopic toolbox that can be used, either with proteome or sub-proteome mixtures or with individual/purified proteins studied in parallel. It gives a modest overview of existing and proven techniques as well as a detailed examination of less established spectroscopic methods with studied speculation on future applications. 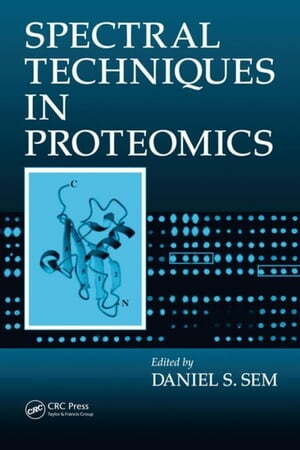 Intended for a broad audience of protein biochemists and biophysicists, the book adopts a wider definition of proteomics to include the systems-based study of proteomes and sub-proteomes involving proteins related through regulatory cascades, metabolic pathways, post-translational modifications, or associated biologic effect, as well as the parallel study of subsets such as proteins with associated protein folds (structural proteomics) or binding sites (chemical proteomics). Beginning by defining the scope of the field as is relevant to spectroscopists, the book then briefly reviews current commonly used spectroscopic methods. It covers separation techniques that typically precede ESI studies as well as MALDI MS/MS based protein identification. SELDI is also presented as a tool that combines separation techniques with MS analysis on the same chip. The book presents studies of protein-protein and protein-ligand interactions using NIR fluorescence, NMR, MS, and SPR. Recent developments in ICAT labeling strategies are addressed along with a discussion of metabolomics. A description of advances in structural proteomics using NMR, x-ray crystallography, and EPR precedes a final summary of current technology and future prospects of the science. Analyzing the current state of the science and the future evolution of the field, Spectral Techniques in Proteomics applies a systems-based approach to studying the function and mechanism of proteins.